Many people think that problem management is all about root cause analysis. This results in a technical focus which often leads to long outage times and lack of focus on the customer. 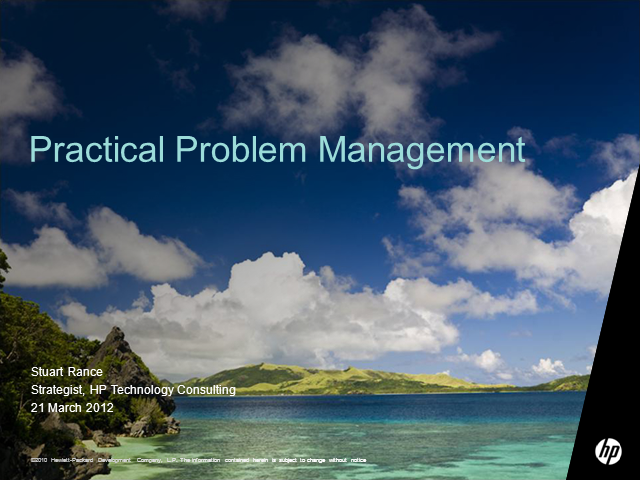 This presentation describes an alternative approach to problem management which focuses on customer outcomes, following this methodology could help you to reduce the impact of problems on your customers and on their business. Stuart has worked with a wide variety of clients in many countries, helping them use strategic service management to create business value for themselves and their customers. Stuart was the author of the 2011 edition of ITIL Service Transition and co-author of the ITIL V3 Glossary and of many service management pocket guides. Stuart creates and teaches ITIL training courses and regularly presents at major public events. He is a senior ITIL examiner for APMG, a Chartered Fellow of the British Computer Society (FBCS CITP), a Fellow in Service Management (FSM) at prISM, and a Certified Information Systems Security Professional (CISSP).